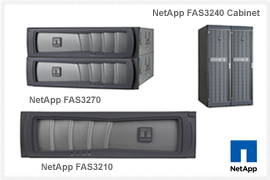 NetApp FAS3200 series storage systems delivers the advantages of the NetApp� unified storage architecture through one operating system, consistent management software, integrated data protection, multiple tiers of storage, and industry-leading storage efficiency. Available in three models NetApp FAS3210, NetApp FAS3240 & NetApp FAS3270. • Lower your costs with the industry-leading storage efficiency of the NetApp unified architecture. • Simple to install, provision, and upgrade. • Consolidate multiple protocols including FC, FCoE, and diverse SAN and NAS workloads. • Seamlessly expand as your needs change. • Maximize productivity with our common suite of management software. • Scale to nearly 3PB of versatile storage that adapts readily to your growing storage demands.